As the partial government shutdown continues into 2019, too much of the media is focused on the political winners and losers of the budget funding stalemate and not enough on the reason for the shutdown. Democrat opposition to border wall funding is rooted in politics and not in reason. Senate Minority Leader Chuck Schumer, D-N.Y., and House Minority Leader Nancy Pelosi, D-Calif., want to deny President Trump a significant campaign promise in hopes of demoralizing the president’s base as the 2020 presidential race approaches. In the end, the Democrats’ strategy will backfire because they are putting politics before the safety and security of Americans. President Trump’s motivation for border security, including a wall, is not that he’s bored and misses his old job of construction projects. The president wants a wall to help secure the southern border to protect citizens from criminal illegal aliens and to impede the flow of drugs that are killing too many Americans. The Christmastime shooting death of police officer Ronil Singh in Newman, California, exposes the risk to Americans from Democrats who oppose funding of a wall and support sanctuary cities. An illegal alien, Gustavo Perez Arriaga, was arrested and charged with homicide as the primary suspect in Singh’s death. In addition to Arriaga, seven others were arrested for hiding him and aiding his attempted escape to Mexico. Arriaga was identified as a member of the Surenos street gang, and some of those arrested were also illegal aliens and may also have connections to the gang. Sanctuary policies coupled with a porous border are a lethal combination for innocent law-abiding Americans. In addition to illegal alien crime, dangerous drugs are flowing over the Mexican border. According to the Centers for Disease Control and Prevention (CDC), 70,237 people died of drug overdoses in 2017. Most alarming is the dramatic increase in overdoses from fentanyl-type drugs. 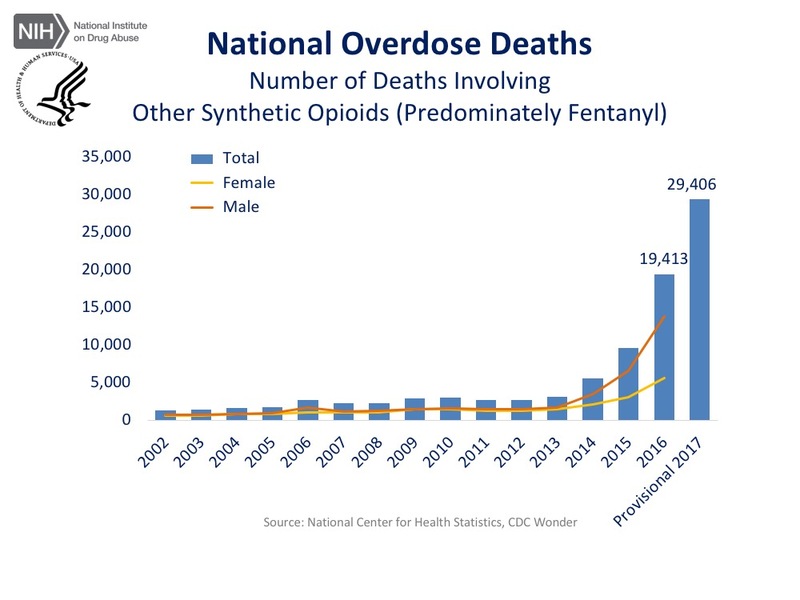 Fentanyl, a synthetic form of heroin, and related drugs were responsible for 28,466 overdose deaths in 2017, a stunning rise from about 3,000 deaths in 2013 based on CDC data. The National Institute on Drug Abuse attributes 29,406 deaths to fentanyl in 2017, up from 19,413 deaths in 2016, more than a 50 percent increase in overdose deaths. Fentanyl, originally designed as an anesthetic, is scarily potent. Fentanyl can be up to 100 times more potent than morphine and is so dangerous that it’s a potential weapon for terrorists and was called “a significant threat to national security” by a former intelligence government official. Mexico is the biggest supplier of heroin to the U.S., and, according to the San Diego Union-Tribune, a major source of fentanyl is drug cartels in Mexico. China is also a major supplier of the drug. A Drug Enforcement Administration official noted a rise in the amount of the potent drugs seized in Arizona coming from Mexico, saying, “We have seen a 2,000 percent increase in the amount of fentanyl powder we seize and a 3,000 percent increase in the amount of fentanyl pills.” Clearly, construction of a border wall will not totally halt drug trafficking, but it will make one route more difficult and allow resources to focus on other modes of illicit transport. Democrats are politically very vulnerable for a partial government shutdown for resisting $5.7 billion for border wall funding, especially since in 2006, many Democrats, including Schumer, voted for a bill to fund construction of a border fence. Pelosi is opposed to a border wall because she feels it’s “immoral, ineffective, expensive,” but her arguments are false and misleading. In fact, she’s wrong on all accounts. Walls do work. A border fencing project in Yuma County, Arizona, combined with border security personnel resulted in a 96 percent drop in illegal alien apprehensions. As for the cost, the Defense Department has $674 billion to spend to protect the U.S. in fiscal year 2019, so the $5.7 billion for a wall is a reasonable amount to protect Americans from illegal aliens and drugs. Pelosi’s “immoral” claim is by far the worst, and the likely incoming speaker of the House of Representatives has it backwards: It’s immoral to block efforts to protect Americans. Democrats were for a border barrier before they were against it, proving they are putting politics before the safety and security of Americans.